I was already sold to this piano trio from Portugal when they released their first album on Clean Feed two years ago, but now they've managed British avant saxophone player John Butcher to join them for a series of concerts, culminating in this fantastic recording.The Portuguese trio are Rodrigo Pinheiro on piano, Hernani Faustino on double bass, and Gabriel Ferrandini on drums and percussion. Whereas they created incredibly dark and ominous soundscapes on their first album, their sophomore effort is opened with John Butcher acting as the crowbar, literally tearing open the trio's concept. The first track, "Sustained", is the shortest and a kind of warming-up for what's going to come. The real power is unleashed on the second piece, "Pachyderm", which starts with eery sounds of extended techniques on piano, bass and drums, with Butcher playing high-toned soft oscillating phrases over it, sensitive and vulnerable, masterfully controlling the moaning timbre of his instrument. 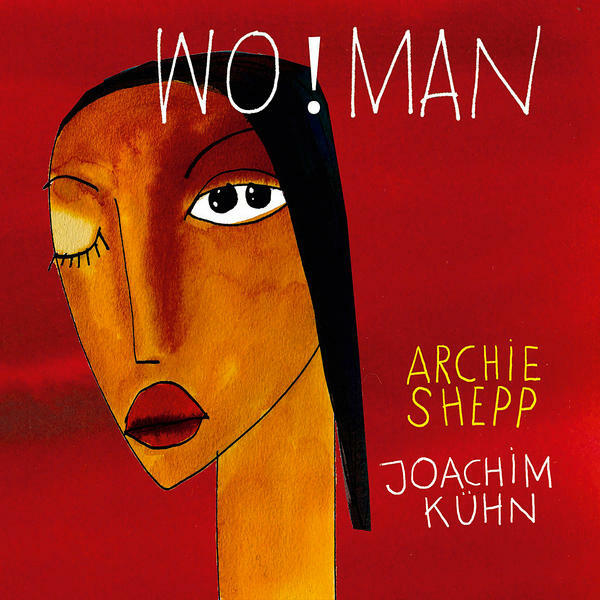 The overall tone becomes a little more lighthearted as the tempo picks up, gradually gaining more volume, becoming violent and angry, and when Butcher suddenly starts whistling on his sax, imitating birds like only he can do it, the trio quietens down, and the bird whistling slowly changes into otherworldly weeping, and as things move to a stage close to silence, all that is left is incredible tension, sustained tension, for minutes on end. 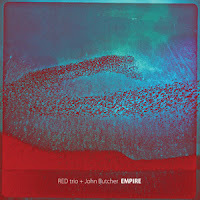 The second side of the LP is the title track, another epic improvisation called "Empire". The four musicians demonstrate the power of minimalism to start with,weaving their fragile sounds around the silence that reigns supreme, for over seven minutes, when the built-up tension does not get released, as you might have thought, but rather intensifies, especially because of Butcher's incredible sense of holding back his breath when you expect him to blow his lungs out. Restraint and sonic control is one of the greatest assets of this band, resulting in a fantastic listening experience. 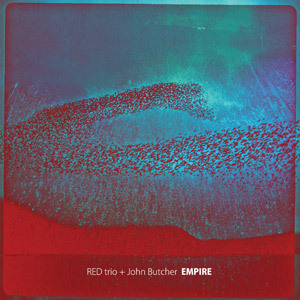 I focused possibly too much on Butcher's presence, and he's without a doubt the most dominant voice on the album, yet the music is of course the RED trio's collective achievement, and they stay close to the musical vision they created with their first album, dark, inventive and intense, with Butcher offering depth, contrast and adding to the already gloomy atmosphere. Not to be missed if you have a sense of adventure. 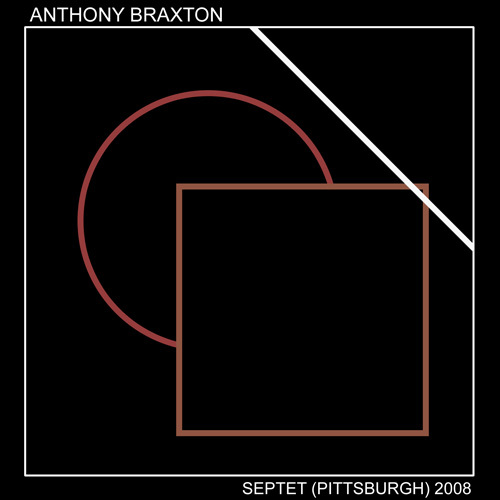 According to Wikipedia, Anthony Braxton released 149 albums between 1968 and 2008. I do believe this is underestimated, because several albums are missing. 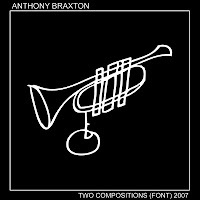 Now, Braxton created the "TriCentricFoundation.org" website, to which you can subscribe with a monthly fee, which gives you two albums a month for $13. That means 24 albums a year if my arithmetic skills are still intact. Braxton has always been prolific, but I guess now he will even surpass his own prior achievements. The good thing is that the saxophonist/composer is incredibly inventive, willing to take risks and to go beyond where many musicians dare to go, experimenting en route, and exploring new avenues if they present themselves. 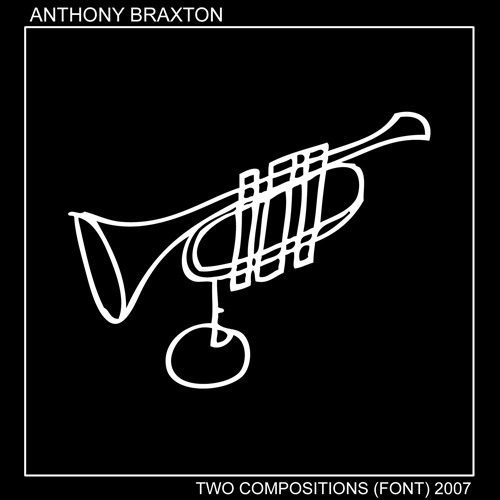 And to his credit, each of these musical avenues Braxton develops is coherent by itself, in the sense that he has a clear idea of the sound, the interaction, the structure, to which he and his bands then stick. 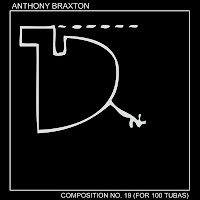 The end result is that the listener can become part of all the various projects and directions that Braxton took over the years. Some are really excellent, some less so, and through this immense variety, it is often hard to pick what is personally gripping. Together, they play one long "Composition 355", on which the band rarely plays in its totality together, rather, you get shifting groups of players, moving the single, hour-long piece forward. As a result, it feels quite light in texture, yet compelling too. It's a great album to listen to, but it will not figure on his discography as one of the most memorable ones. 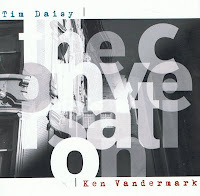 This is the best album in the series, with Anthony Braxton on soprano sax, alto sax, contrabass clarinet, live electronics, Taylor Ho Bynum on cornet, flugelhorn, piccolo, bass trumpet and valve trombone, Mary Halvorson on electric guitar, and Katherine Young on bassoon. The music is varied, the playing excellent. And I am not usually a fan of Mary Halvorson, but on this performance I start to understand what the hype is all about. And all four players are at their best. The small band and the absence of percussion and bass gives the music a chamber jazz kind of feel. 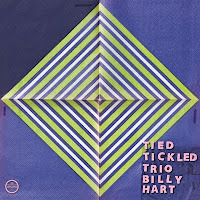 Light-textured, captivating, and extremely varied for again a composition/improvisation that lasts more than an hour. That's the feeling I get : its Bill Dixonesque in a way. 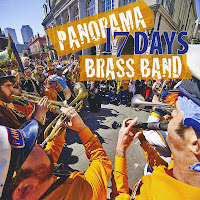 (In reality I count only 65 tuba-players, but I guess that's not really the point). This album is also unique and absolutely astonishing. The fist piece, "Composition N° 103" starts with classical orchestral music and recorded ambient sounds over which the band starts improvising-performing. Obviously, because it's written for trumpet, Braxton limits himself to the conductor role. 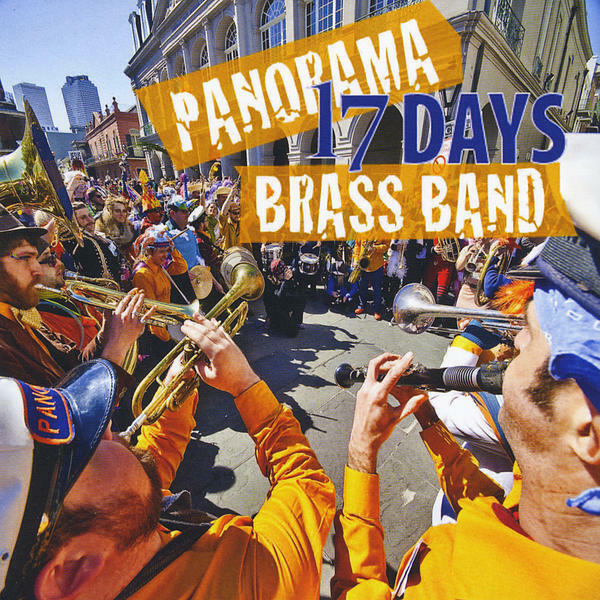 The band consists of the incredible line-up of Taylor Ho Bynum, Tim Byrnes, Forbes Graham, Sam Hoyt, John McDonough, Nicole Rampersaud and Nate Wooley, all on trumpet or cornet. 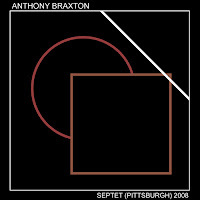 The composition has the typical Braxton elements of abstract and high intervallic jumps, either fully arranged - often staccato - moments, with intermittent solo improvisations by the musicians. The second piece, "Composition N° 169" is played by Taylor Ho Bynum on cornet, Nate Wooley on trumpet, Mark Taylor on French horn, Reut Regev on trombone and Jay Rozen on tuba. 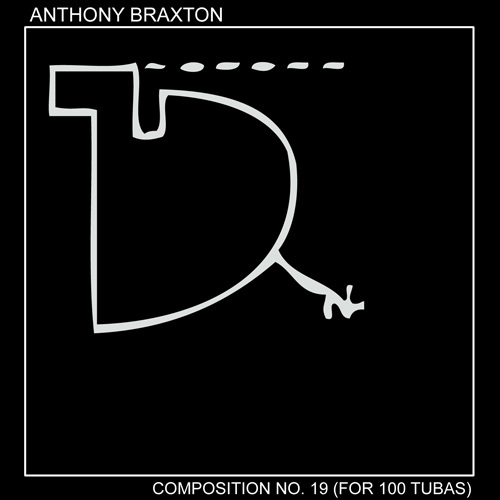 Because of the broader range of instruments, the sounds is a little warmer than with the seven trumpeters, slow, with a kind of decided forward motion, yet again with the typical Braxton cerebrality that creates a shade of too much intellectual distance in his search for aesthetic control. Classical music is never far off - but then of the more modern kind - and I am a jazz man at heart. Give me some more improvisation and soul and rough edges and humanity in the unpredictability and potential for mistakes. Great stuff, but I wish the reigns could have been more loose. 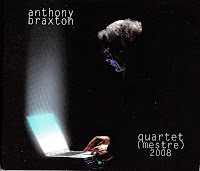 PS - If anyone has the complete Anthony Braxton discography, I'd be really intrested in publishing it here. Musical interplay is a lot about dynamics, the energy flows, the changing levels of intensity and the currents that make musicians interact with each other. This trio, with Tim Trevor-Briscoe on saxophone, Szilárd Mezei on viola, and Nicola Guazzaloca on piano is almost all about dynamics. The texture of their music is to be compared with pointillism, short, patternless dots of sound that cluster together to create an imagery that only becomes clear when looked at from a distance. The only images you get to see here are internal ones. Have you ever watched long stems of grass moving in the wind, now unmoving, then suddenly all moving in the same direction by the invisible wind? Or have you watched long seaweed flowing under water, being softly moved then suddenly all weeds wave frantically together as a wave crashes overhead? Or have you wondered about the rapid joint movements of a flight of starlings? Nothing happens, then suddenly something happens and everything happens, at breakneck speed all unconnected things moving together, as one, then back to rest. This is how this music is. At first listening, the approach seemed pretty abstract and distant, and not easy to get into it, but now, after at least ten hours of listening, the beauty of the incredible dynamics of this excellent trio unfolds while remaining a mystery - all three move as one, soft-spoken, vulnerable, sensitive, then moving into dense, violent outbursts full of rage and volume, only to fall back to more gentle interactions. Like the grass, the seaweeds and the starlings, you can only watch it happen, and admire its beauty and unexpected common movements, moved by something invisible, yet that is clearly there, must be there, because otherwise how could three move as one? 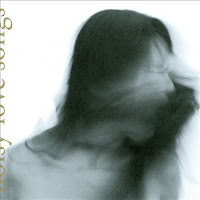 Satoko Fujii is a prolific composer, yet it was a while since she released a new album, probably taking time to tour and to compose. Now she's back with two stunning albums (actually three), which I will review together for an interesting reason. 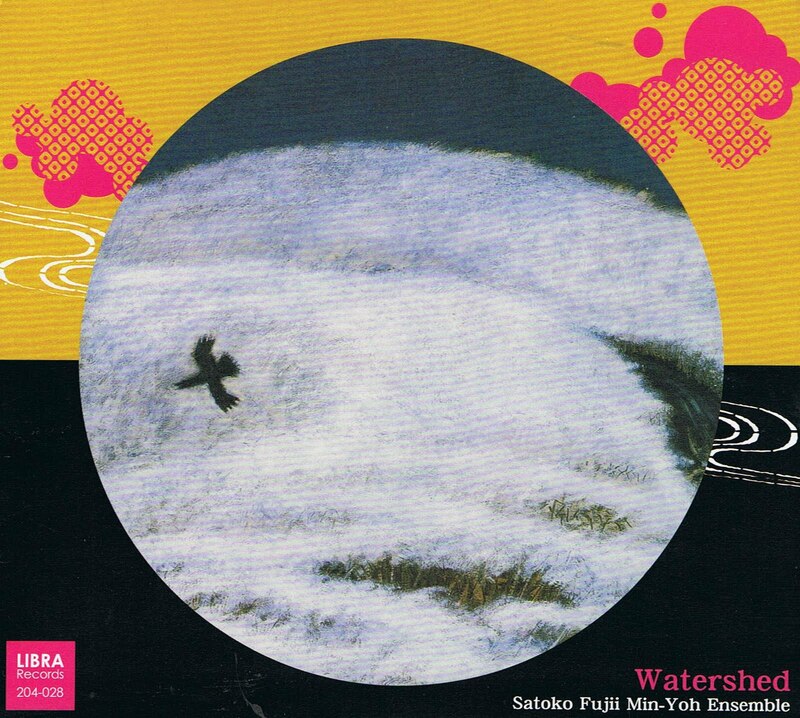 The first one is "Watershed" with Fujii on piano, her husband Natsuki Tamura on trumpet, Curtis Hasselbring on trombone and Andrea Parkins on accordion. 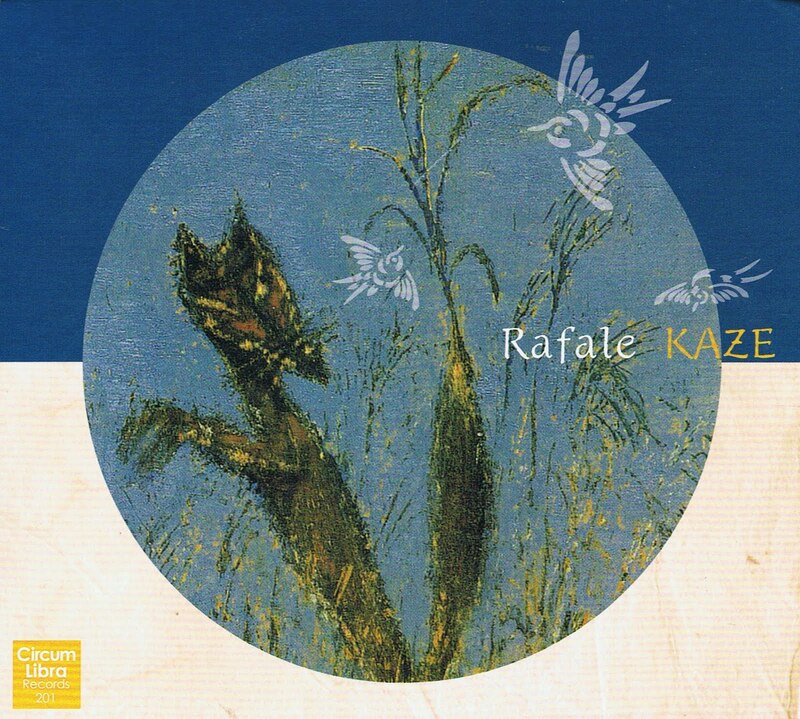 The second one is "Rafale", with Fujii and Tamura accompanied by the French musicians Christian Pruvost on trumpet and Peter Orins on drums. When I first listened to both albums, "Rafale" struck me immediately as significant, eloquent and strong, with a two trumpet line-up, memorable compositions and excellent playing. "Watershed", showed a little less immediate access, possibly because of its even more bizarre line-up. Yet with increased listening, and attentive listening, my preference started changing, moving into the direction of "Watershed". I hope I can expain why. This is the second album of Fujii's Min-Yoh ensemble - "Fujin Raijin" being the first, which takes music from traditional Japanese folk and turns it into something else, as you will read below. The album is an absolute delight, and one that reveals more and more nuances as you listen to it more. It is a little gem. A gem of musical performance. And a gem of musical vision. To start with the vision : all compositions have quite identifiable and often fun themes, with often odd time signatures, and joyful as if you are listening to Don Cherry (on "Whitewater") or the Pinguin Café Orchestra (on "Sorambushi"). Yet these tunes are just the basis, the surface. 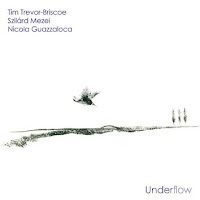 Below the surface, the four musicians paint a totally different landscape, one of tension, drama, conflict and distress, full of dissonance, weird sounds, and sudden trumpet blasts of sheer horror, as if some deep and unfathomable mysteries are hiding in the deep dark. The musicians drag you really out of your comfort zone, and bring you back into it ... sometimes ... In the meantime, you've been to unusual places, yet somehow, there is a happy ending. You know you've been to a place you maybe shouldn't have been, or even several, but the soothing sounds of the last track, "Estuary", bring you a happy ending. All is calm, all is peace again. A gem of musical performance : if two musicians on earth should be able to play music telepathically, it must be Fujii and Tamura. And they do. The absolute revelation in this context is the interplay with Parkins and Hasselbring. Parkins is an incredible scene-setter, playing her accordion more as an harmonic instrument, a sound-builder, almost like an harmonium, redefining the role of her instrument as she's done many times before. Hasselbring too, is a trombonist to my heart, using the instrument's unique propensity for warm, long and moaning gliding tones, but equally versatile to drive it headfirst into dissonance as in the incredible duo with Parkins on "Cascade". And the unique interaction, with shifting moods, genre and sub-genres is absolutely exceptional, chaos evolving into unison lines, duo shifting into trios, then other trio, and duo and back to full quartet, as if all four where just one being. So, really strong. Incredibly rich music. Incredibly creative too. With unheard genre-bending innovation. But you have to go deep under the surface. And be willing to. I hope that this album, co-released on the French Circum with Fujii and Tamura's Libra label, will give the music some more sales in Europe. On "Crossword Puzzle", Tamura was already joined with another trumpeter to form the front line, then with Angelo Verploegen, now he is joined by Christian Pruvost. From a sonic point of view the collaboration works well, as both trumpeters have a broad range of techniques, from the more traditional to the most avant-garde. All tracks have the same kind of structure, starting with unusual sonic landscapes and lots of extended techniques, by one or two instruments, and then halfway through the piece form starts to emerge, in the form of chords, or chord patterns, maybe some rhythm and yes, eventually a theme. The first piece, "Noise Chopin", grows out of voiceless trumpet whispers and the strumming of piano strings to Chopin's piano sonate n° 2, better known as the "Funeral March", only fully recognisable after eleven minutes into the composition, with first the piano, then one trumpet, then the other one, being dragged into the theme, until it blooms open in its full beauty, with the drums hitting hard, almost tribal, to avoid the real march rhythm, wayward and obstinate. "Anagramme", composed by Orins, starts with bird-like chatter between both trumpets, as if you've been locked up in a bird cage, with plucked strings and cymbals creating a sizzling background, out of which the piano starts actually playing a few notes with the expected tonal color, the drums picking up rhythm, while the trumpets keep their mad dialogue going, until after five minutes the theme emerges, played by Tamura (I think), beautifully, followed by Pruvost, muted and in counterpoint, really solemn and beautiful until Orins brings in a rock rhythm, and the same theme gets a totally different, now jubilant character, with Orins adding some crazy counterbeats to make the musical feast even more enjoyable. The drums lead us into the next piece, "The Thaw", a Fujii composition that we also find back on "Watershed", and which gradually develops from drums to romantic piano with both trumpets sounding like a the wind on the background, until they find their voices, playing the theme in full unison, sensitively, fragile, leaving the theme and coming back to it. "Marie-T", penned by Orins, is even more fragile, barely existing, despite its full eight minutes, a piece of lace. The next piece, "Poly", starts with the lace, yet develops into some hard-hitting rock drums again, with a broken rhythm, heavier, full of drama. "Blast", the last track, is sheer madness, evolving out of absolute chaos, into a forward-driving rhythm, played by the piano, and when the trumpets take over the theme, the piano and drums go totally berserk again, then the drums for a solo, some shouting, and then the unbelievable contrast of two trumpets playing a hymn-like theme over the general mayhem created by drums and piano, until Fujii picks up the theme with steady pounding left hand, and drives the whole quartet into full forward motion into its magnificant grand finale. Again, an incredibly rich listening experience, ranging for intimate impressionism to bursts of expressionism, from soundtrack-like car-chase elements to avant-garde soundscapes, and with the occasional rock beat. You get it all here, in spades. Jazz, you wonder? Who cares. Both highly recommended albums. My star-rating could have been the reverse, or both five stars. The most incredible thing about Fujii and Tamura is their endless creativity. Every new album stands on its own, redefines listening to music, redefines genres, redefines playing music. Just buy both albums. You will not be disappointed. 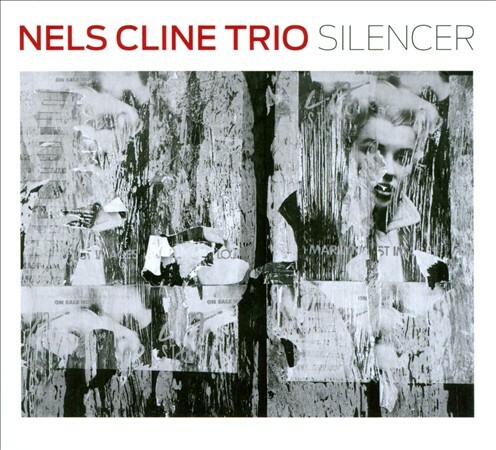 On a regular basis, I add the new covers of Ornette Coleman's "Lonely Woman", one of his most beautiful compositions ever, and not to be mistaken by the Horace Silver ballad with the same title. Here is the full list of all the covers that I identified so far. You can add suggestions. I will start with three covers that appeared this year and that are worth mentioning. 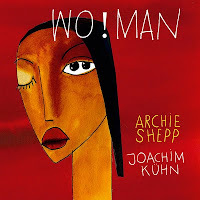 Joachim Kühn and Archie Shepp produce a nice album. Good playing, yet nothing memorable. A brass band playing Lonely Woman? Yes, and not bad at all. Gone are of course the foreboding and sad atmosphere, but even in jest, the composition stands. 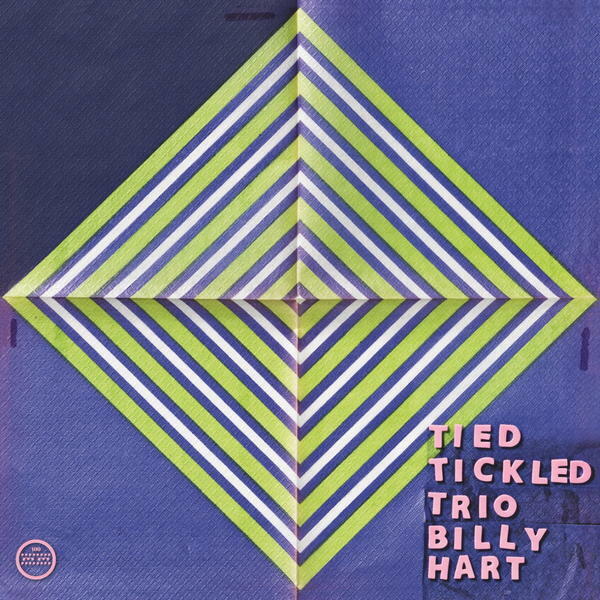 Quite unusual music, with electronics and drummer Billy Hart, kind of electronic ambient. Also their take on "Lonely Woman", embedded in some of their own music, is quite good. Highly unusual.